Learn all the best abdominal exercises for men and women, and try the free abdominal workouts on this site. 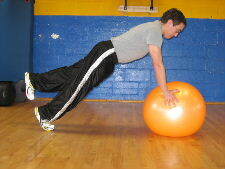 The Stability Ball is a very popular tool for abdominal exercises and core exercises. On this page, there are 2 variations of the 1 leg plank exercise, utilizing a stability ball. They are both advanced abdominal exercises, so try mastering the regular plank on the floor before trying it on the ball. The variations below will have either your elbows or the hands on the stability ball. You can also perform the one leg plank with the feet on the ball. If your feet are on the ball, your legs and hips will feel the greatest stability challenge, and if your hands are on the ball your shoulders and arms will feel the greatest stability challenge. With any version of 1 leg planks on a ball, your abdominals and core will feel a ton of work. You can do this exercise from your elbows or your hands. For most people the elbows is a little harder than the hands, but they are both challenging. Starting Position: Place your hands firmly on a stability ball, and slowly step your feet backwards until you are in the plank position. 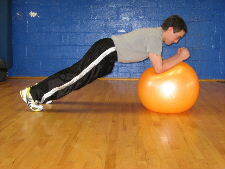 Form: When you reach the full plank position, engage your abdominals to keep your back stable. Then, slowly lift one foot off the floor and hold that position for 10-30 seconds. Switch legs and hold for 10-30 seconds on the other side. Personal Trainer Tips: If you are trying this exercise for the first time, you can wedge the ball against a wall to make it more stable. That will help to make sure it doesn't roll from underneath you. This exercise requires a ton of core strength, and if your abs are weak, you will likely shake a lot and may fall off the ball. So progress to this exercise only after you have build up your strength with other exercises first. When you lift your leg, you don't have to lift it as high as possible. Simply lift it 2-6 inches off the floor. You can perform this exercise as an isometric exercise, which means that you would just hold like the instructions above describe. You can do repetitions on one leg at a time or do alternating repetitions on each leg. You can also do one legged planks while holding from your elbows. 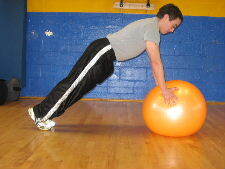 When your elbows are on the ball, you may feel more muscle work in the shoulders and abdominals. Remember that these are advanced exercises, so master the basics first, listen to your body, and build up slowly. The plank and all the plank variations are among the best abdominal exercises for men and women. Often, men and women choose different exercises for their core, but the best abdominal exercises for men are also the best abdominal exercises for women. Visit the Picture Directory of Abdominal Exercises to learn more of the best abdominal exercises for men and women or try one of the free abdominal workouts. 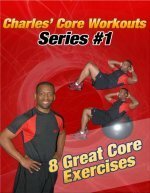 Here's a list of all the abdominal exercises on this site.